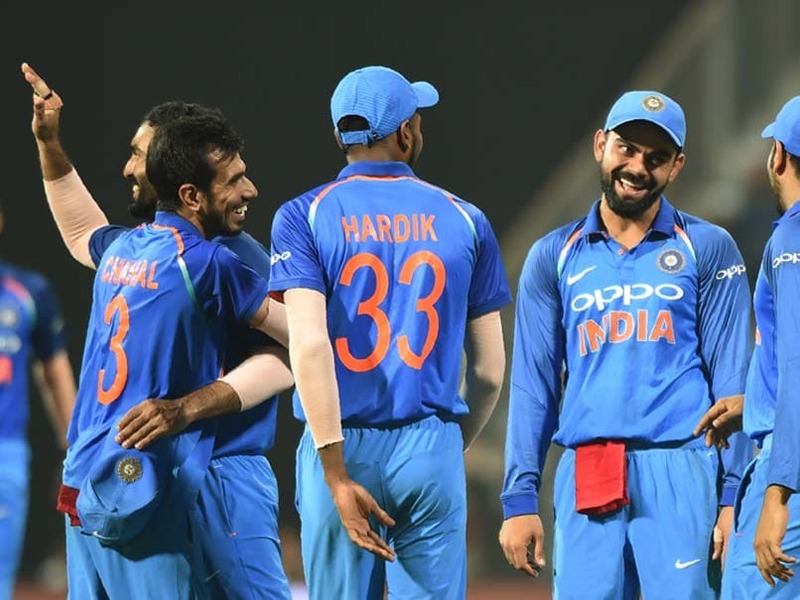 Jasprit Bumrah produced a brilliant bowling performance in trying circumstances to help India restrict New Zealand to 331 for seven after the hosts had scored 337 for six after being put into bat in Kanpur on Sunday. India beat the visitors by six runs in third and final ODI in a thrilling contest at Green Park to clinch the three-match ODI series 2-1. Earlier, opener Rohit Sharma and captain Virat Kohli slammed centuries to power India to a big total. Rohit (147), who brought up his 15th ton, smashed 18 boundaries and two sixes in his 138-ball knock. Kohli scored 113 runs in his 106-ball innings. His knock was studded with nine boundaries and one six. For New Zealand, Tim Southee, Adam Milne and Mitchell Santner claimed two wickets apiece. 21:28 IST: Santner guides Bumrah towards fine leg for a couple. 21:27 IST: Grandhomme takes a single and gives strike to Santner. New Zealand need 14 off 4 balls. 21:26 IST: Brilliant start from Bumrah. He starts with a dot ball. 21:25 IST: New Zealand need 15 runs off last over. Bumrah to bowl the last over? 21:20 IST: SIX! Santner smashes Bhuvneshwar towards long on for a maximum. How costly this going to be for India? New Zealand need 17 off 10 balls. 21:18 IST: WICKET! New Zealand lose sixth wicket. Tom Latham is run out for 65 runs. New Zealand 312/6, need 26 off 13 balls. 21:16 IST: And, it's NOT OUT. Latham is safe. 21:15 IST: A loud LBW appeal from Bumrah. Umpire says NO. Kohli has asked for a review. 21:13 IST: Excellent yorker from Bumrah. Brilliant bowling from him in death overs. 21:10 IST: BIG WICKET! Bhuvneshwar castles Henry Nicholls for 37 runs. New Zealand 306/5, need 32 off 19 balls. Huge celebration from the pacer and his team-mates. 21:07 IST: Excellent fielding by Virat Kohli at long off. 21:05 IST: New Zealand need 35 runs off 24 balls. 21:03 IST: SIX! Nicholls sends Bumrah over the third man region. And, it's a SIX. 300 up for New Zealand. 21:03 IST: FOUR! Nicholls leans back and pulls the ball towards deep mid wicket. 21:02 IST: Full toss from Bumrah. Nicholls smashes the ball towards long on. He takes the first and runs hard for the second. Brilliant running between the wickets. 20:56 IST: New Zealand need 52 off 32 balls. 20:51 IST: FOUR! Nicholls smashes Pandya towards deep backward point for a boundary. Excellent shot from the Kiwi batsman. 20:48 IST: 12 runs off Chahal's over. New Zealand need 66 in 42 balls. 20:46 IST: FIFTY! Tom Latham scores his 9th half-century. New Zealand 266/4, need 72 runs in 44 balls to win. 20:39 IST: FOUR! Henry Nicholls sends Kedar Jadhav towards long off for a boundary. 20:35 IST: BIG WICKET! Jasprit Bumrah dismisses Ross Taylor for 39 runs. New Zealand 247/4 in 40.1 overs. 20:31 IST: FOUR! Latham leans back and cuts the ball towards deep backward point. Bhuvi isn't happy with this shot. 20:25 IST: Four back-to-back dots from Bumrah. Excellent bowling from the unorthodox pacer. 20:18 IST: Ross Taylor sends Bhuvneshwar towards square leg. He will get a couple. 20:10 IST: It's time for DRINKS! New Zealand need 117 runs in 84 balls. 20:04 IST: FOUR! Ross Taylor opens the face of the bat, uses the pace and guides Axar Patel towards third man for a boundary. New Zealand 214/3, need 124 off 90 balls. 20:00 IST: FOUR! Ross Taylor ends Pandya's over with a boundary towards backward square leg. New Zealand 205/3 in 34 overs, need 133 more to win. 19:58 IST: FOUR! Latham plays this too late. He goes on backfoot and slashes the ball towards deep backward point for a boundary. 19:56 IST: FOUR! Latham guides Axar towards third man for a boundary. New Zealand 194/3 in 33 overs, need 144 more runs to win. 19:51 IST: FOUR! Latham opens the full face of the bat and sends Pandya straight down the ground for a boundary. New Zealand 182/3 in 31.2 overs, need 156 to win. 19:49 IST: 31 overs gone! New Zealand 177/3, need 161 more runs to win. 19:33 IST: A missed run out and a collision between Williamson and Pandya. It seems Pandya has hurt his finger. No serious damage as both players are back in action. 19:25 IST: Ross Taylor is the new man at the crease. 19:23 IST: WICKET! Yuzvendra Chahal gets the breakthrough, ends Colin Munro's stay at 75. New Zealand 153/2 in 24.2 overs. 19:20 IST: SIX! Munro smashes this hard towards deep mid wicket. 19:13 IST: FIFTY! Kane Williamson brings up his 32nd half-century. 19:09 IST: FOUR! Williamson leans forward and smashes Jadhav towards deep mid wicket for a boundary. New Zealand 131/1 in 20.5 overs, need 207 more runs to win. 19:06 IST: Williamson hits Jadhav towards deep square leg for a single. 19:04 IST: Brilliant stumping from Dhoni. But he is not looking confident. Replays shows Munro is safe. 18:52 IST: FOUR! Munro sends Jadhav towards deep backward point. New Zealand 110/1 in 15.4 overs. 18:51 IST: FOUR! Williamson goes on backfoot and cuts the ball towards deep extra cover for a boundary. 18:50 IST: 100 comes up for New Zealand in 15 overs. They need 238 more to win. 18:48 IST: Beauty from Chahal. Spinning web from the youngster. It turns and Dhoni removes the bails in a flash. 18:46 IST: FIFTY! Colin Munro brings up his fourth half-century. New Zealand 98/1 in 14 overs, need 240 more runs to win. 18:45 IST: 50-run partnership comes up between Williamson and Munro. 18:43 IST: FOUR! Williamson dances down the track and sends Axar Patel towards long off for a boundary. 18:41 IST: FOUR! Kane Williamson waits till the end and slices the ball towards deep backward point for a boundary. 18:40 IST: Just 2 runs off Jadhav's over. New Zealand 82/1 in 12 overs. 18:36 IST: Virat Kohli brings Kedar Jadhav into the attack. 18:24 IST: SIX! Munro plays this shot with bottom hand and sends Bhuvneshwar over the deep mid wicket region for a maximum. New Zealand 69/1 in 8.3 overs. 18:20 IST: FOUR! Hardik Pandya comes into the attack. Williamson welcomes the pacer with a superb boundary towards deep mid wicket. 18:19 IST: 50 comes up for New Zealand. They need 287 more runs to win. 18:12 IST: WICKET! Jasprit Bumrah removes Martin Guptill for 10 runs. New Zealand 44/1 in 5.1 overs. 18:10 IST: FOUR! Munro guides Bhuvneshwar towards third man for a boundary. New Zealand 44/0 in 5 overs. 18:08 IST: Guptill plays this towards deep extra cover. He will get 3 runs. Excellent running between the wickets from Guptill and Munro. 18:07 IST: Three wides from Bhuvneshwar. 17:56 IST: FOUR! Martin Guptill sends Bhuvneshwar towards sweeper cover for a boundary. New Zealand 32/0 in 2.4 overs. 17:52 IST: FOUR! Colin Munro stands tall and lofts the ball over Bumrah's head. One bounce and boundary. New Zealand 24/0 in 1.5 overs. 17:50 IST: 19 runs off Bhuvneshwar's first over. New Zealand 19/0 in 1 over. 17:49 IST: FOUR! Munro hist Buvneshwar for back-to-back boundaries. Excellent start from New Zealand. 17:48 IST: SIX! Munro starts with a maximum. The left-hander comes forwards and sends Bhuvneshwar over deep mid-wicket region. Century toh haemoglobin ki tarah Virat Kohli ke khoon mein hi shaamil ho chuki hai. 32 one day 100’s in 202 matches. Couldn't fit @ImRo45 in the same tweet, his knock deserved a separate tweet. Class and style personified, well done on another ton bro. number 32, watching a game from the start after a long time. Top knock from @imVkohli , over to the bowlers now to seal another series. 17:44 IST: Welcome back for the chase at Green Park. New Zealand need 338 runs to win. 17:04 IST: India 337/6 in 50 overs against New Zealand. 17:00 IST: WICKET! Adam Milne dismisses MS Dhoni for 25 runs. India 331/5 in 49.1 overs vs New Zealand. 16:58 IST: SIX! Another maximum of India's innings. This time it came off Kedar Jadhav's bat. The right-hander smashes the ball over backward square leg region. India 331/4 in 49 overs. 16:56 IST: Kedar Jadhav hits Southee towards deep extra cover. He will get a couple. 16:51 IST: FOUR! Kedar Jadhav sends Trent Boult towards deep backward point for a boundary. India 315/4 in 47.5 overs. 16:47 IST: WICKET! Tim Southee ends Virat Kohli's stay at 113. India 302/4 in 46.4 overs vs New Zealand. 16:45 IST: 300 comes up for India in 46.3 overs. 16:41 IST: The King Kolhi reaffirms his dominance. 16:36 IST: FOUR! Dhoni sends Milne towards backward square leg for a boundary. India 284/3 in 44.4 overs. 16:32 IST: MS Dhoni is the new man at the crease. 16:30 IST: WICKET! Mitchell Santner dismisses Hardik Pandya for 8 runs. India 273/3 in 43.2 overs vs New Zealand. 16:27 IST: CENTURY! 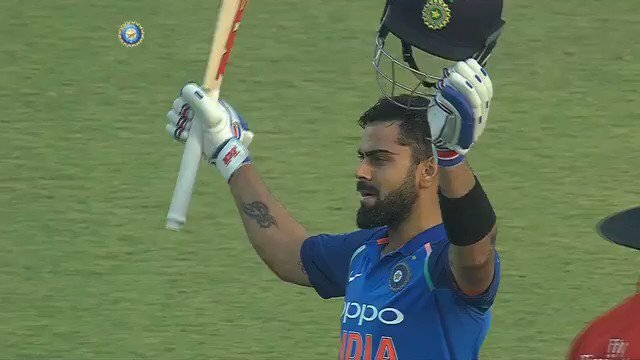 Virat Kohli brings up his 32nd ODI century off 96 balls. India 273/2 in 43.1 overs. 16:25 IST: FOUR! Hardik Pandya goes on backfoot and sends Adam Milne towards deep backward point for a boundary. India 271/2 in 42.5 overs. 16:21 IST: Hardik Pandya comes to the crease. 16:19 IST: WICKET! Mitchell Santner ends Rohit Sharma's stay at 147. India 259/2 in 41.2 overs vs New Zealand. 16:11 IST: FOUR! Rohit Sharma goes on backfoot and launches the ball over covers for a boundary. India 252/1 in 40 overs. 16:05 IST: SIX! Virat Kohli launches Santner towards long off. What a hot from the Indian captain. India 242/1 in 38.3 overs. 16:03 IST: 9000 ODI runs for Virat Kohli. 16:02 IST: FOUR! It is raining boundaries at Green Park. Kohli opens the face of the bat and guides Grandhomme towards third man. 16:01 IST: FOUR! Rohit Sharma sends Grandhomme towards long on for another boundary. 16:00 IST: FOUR! Half Volley from Grandhomme. Kohli smashes him towards long on. What a shot from him. 15:58 IST: Flurry of boundaries! 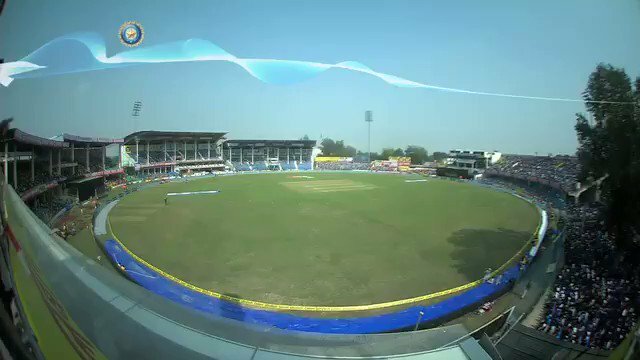 Rohit Sharma hits Trent Bount for three boundaries. 17 runs off the New Zealander's over. India 213/1 in 36 overs. 15:45 IST: FOUR! Rohit picks the length of the short ball and smashes Milne for a boundary. India 193/1 in 34 overs. 15:43 IST: CENTURY! 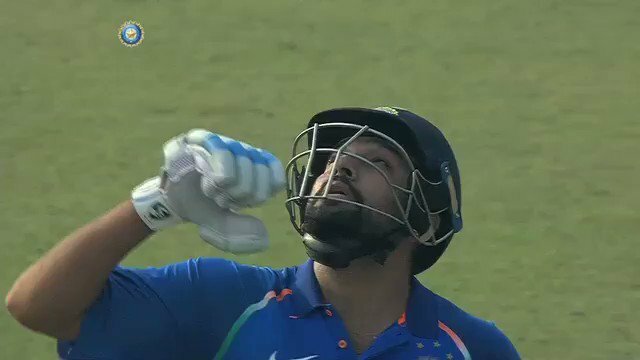 Rohit Sharma slams his 15th ODI century. What a moment for the right-hander. He equals Virender Sehwag's record of 15 centuries. 15:36 IST: FOUR! Kohli plays this with straight bat. The Indian skipper sends Milne straight down the ground for a boundary. India 178/1 in 31.2 overs. 15:31 IST: FOUR! Rohit Sharma moves to 97 with a boundary off Santner straight down the ground. 15:29 IST: FIFTY! Virat Kohli brings up his 46th ODI half-century. India 161/1 in 29.2 overs. 15:23 IST: SIX! 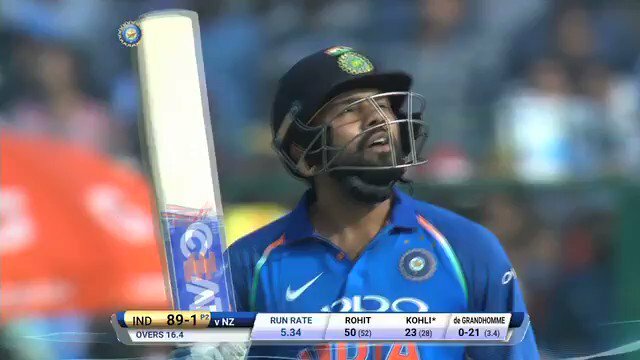 Rohit Sharma waits till the end and launches Santner in style towards long on. What a shot from him. 150th SIX for Rohit in ODIs. India 153/1 in 28 overs. 15:13 IST: 25 overs gone! India 134/1. Rohit Sharma 74*, Virat Kohli 43*. 15:04 IST: 1000 ODI runs for Rohit Sharma in 2017. 15:01 IST: FOUR! Kohli shuffles across and clips the ball between mid-on and mid-wicket for a boundary. 14:52 IST: FOUR! Rohit leans back and sends Grandhomme towards backward square leg for a boundary. India 104/1 in 19 overs. 14:50 IST: 100 comes up for India in 18.4 overs. 14:48 IST: FOUR! Rohit welcomes De Grandhomme with a superb boundary towards deep backward point. India 98/1 in 18.2 overs. 14:40 IST: FIFTY! Rohit Sharma brings up his 35th ODI half-century. India 90/1 in 16.5 overs. 14:33 IST: 50-run stand comes up between Virat Kohli and Rohit Sharma. 14:31 IST: FOUR! Rohit is in ominous touch today. He plays a sweep shot and the ball races towards the boundary. India 77/1 in 14 overs. 14:27 IST: FOUR! Rohit uses the pace and pulls the ball towards square leg for a boundary. India 67/1 in 12.5 overs. 14:16 IST: SIX! Rohit Sharma picks the length nicely and smashes the ball over mid-wicket region. First maximum of the match. India 53/1 in 9.5 overs. 14:09 IST: FOUR! Sheer timing from Kohli. The India skipper guides Southee towards sweeper cover for a boundary. India 43/1 in 8.2 overs. 14:08 IST: FOUR! Rohit plays this with straight bat and sends Boult towards long on. What a shot from the right-hander. India 39/1 in 8 overs. 14:02 IST: FOUR! Virat Kohli opens his account in style. He flicks the ball towards mid wicket for a boundary. India 33/1 in 6.5 overs. 14:00 IST: WICKET! India lose their first wicket. Tim Southee dismisses Shikhar Dhawan for 14 runs. India 29/1 in 6.1 overs vs New Zealand. 13:56 IST: FOUR! Another beautiful shot from Dhawan. The southpaw comes forward and sends Trent Bount towards covers. India 28/0 in 5.4 overs. 13:52 IST: FOUR! Rohit waits till the end, plays an upper cut. The ball races towards the third man for a boundary. India 22/0 in 5 overs. 13:50 IST: FOUR! That's Dhawan's special. He leans forward and plays a beautiful cover drive. 13:48 IST: Team India are unchanged for the final ODI. 13:40 IST: FOUR! Dhawan plays this too late and sends the ball beautifully towards deep backward point. India 11/0 in 2 overs. 13:35 IST: FOUR! First boundary of the match. Rohit Sharma slashes the ball towards deep backward point for a boundary. India 6/0 in 0.5 over. 13:30 IST: India openers Rohit Sharma and Shikhar Dhawan are making their way to the middle. Tim Southee to start the proceedings for Black Caps. 13:28 IST: It's time for national anthems. 13:01 IST: NEW ZEALAND CAPTAIN KANE WILLIAMSON OPTS TO FIELD AGAINST INDIA at Green Park. 13:00 IST: It's TOSS time guys. 12:50 IST: Here's how Team India practiced ahead of the third ODI. 12:45 IST: Hello and welcome to the Live coverage from the third and final ODI between India and New Zealand at Green Park stadium in Kanpur. Rohit Sharma is due for a big score after making 7 and 20 in the earlier games. Just like the home team, the Black Caps would look to get back to winning ways as they remain within touching distance of winning a rare series in India. For starters, they would have to put up a much better batting effort than what they managed in the previous game. Ross Taylor and Latham had bailed them out in Mumbai with a match-winning 200-run stand after New Zealand had lost their top three for 80 runs. The top three did not do much either in Pune but with Taylor and Latham also not firing on that occasion, they ended up with a below par 230. There can't be a better time for captain Kane Willamson to lead from the front after a couple of failures.